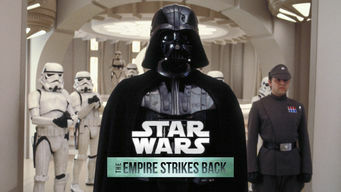 How to watch Star Wars: Episode V: The Empire Strikes Back (1980) on Netflix France! Sorry, Star Wars: Episode V: The Empire Strikes Back is not available on French Netflix, but you can unlock it right now in France and start watching! With a few simple steps you can change your Netflix region to a country like Panama and start watching Panamanian Netflix, which includes Star Wars: Episode V: The Empire Strikes Back. We'll keep checking Netflix France for Star Wars: Episode V: The Empire Strikes Back, and this page will be updated with any changes. Star Wars: Episode V: The Empire Strikes Back is not available in France BUT it can be unlocked and viewed! The epic saga continues as Luke Skywalker, in hopes of defeating the evil Galactic Empire, learns the ways of the Jedi from aging master Yoda. As a high-stakes chase unfolds across the galaxy, a new Jedi is born. The next step in a daring odyssey. Ready are you? There is a way to watch Star Wars: Episode V: The Empire Strikes Back in France, even though it isn't currently available on Netflix locally. What you need is a system that lets you change your Netflix country. With a few simple steps you can be watching Star Wars: Episode V: The Empire Strikes Back and thousands of other titles! Watch "Star Wars: Episode V: The Empire Strikes Back"